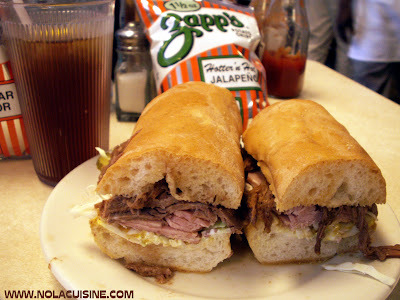 From Cochon Restaurant – New Orleans, LA. There were a few dishes that I wished I had tried on my previous dining experience, so I made another go at it. 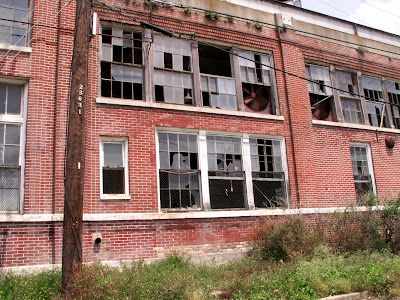 On a side note, Chefs Donald Link and Stephen Stryjewski also recently opened a second Cochon Restaurant in Lafayette, Louisiana. Here are the dishes that I had a second chance at sampling, well worth the wait! All of these are actually featured in his cookbook as well! Perfectly fried chicken livers on toast points, slathered with housemade Pepper Jelly and finished with a salad of mint leaves and sweet onions. Cooked in the restaurants wood burning oven, these baked oysters, topped with a compound butter made with Vietnamese Chili sauce among other inredients, were easily my favorite of the appetizers. The plump Louisiana Oysters with the spicy, garlicky butter sauce were absolutely addicting. 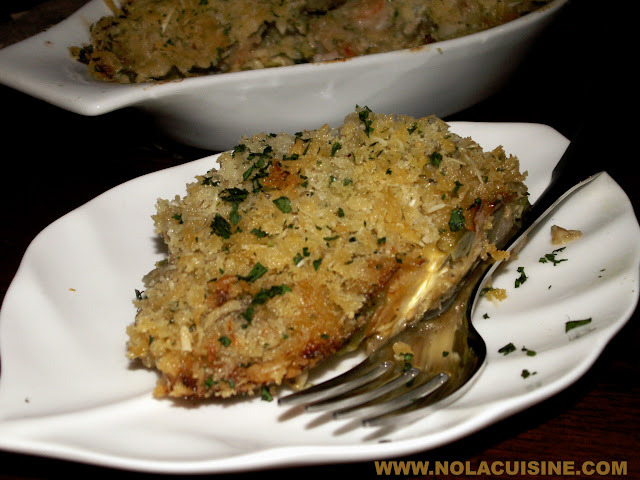 Definitely one of my new favorite Louisiana Oyster dishes, of which I have many. Lastly dessert, Blueberry Buckle with…get this…Hog Cracklin’ Streusel topping! There has to be some kind of award for most creative way to incorporate pork into a dessert, with delicious results! Of course, I will end this post with a picture of the restaurants woodpile, which is starting to become my signature on the sister site to this one American Gourmand. Lard…the four letter word. Like one of my other favorite four letter words, if used in moderation, it can add emphasis and an added oomph…and let’s face it, sometimes, just sometimes, there is no other word that can be used that will properly express your feelings as well as that four letter word. Lard makes things taste good. I’m going to repeat that, because it bears repeating. Lard makes things taste good! 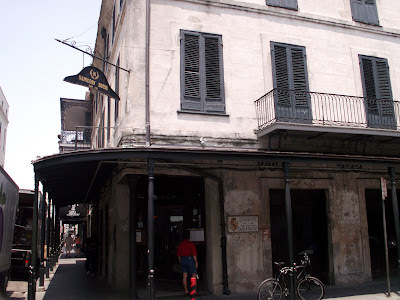 That is all I’m really concerned about here on Nola Cuisine, making things taste good, and making people happy with food, and by people, I mostly mean me and my family. I share my thoughts and hope you enjoy them too. Lard makes things taste good, when things taste good, they make me feel good, when I feel good, it lowers my stress level, and believe me, the stress is going to kill me far before the lard does. I use lard in moderation mind you, I’m not condoning cooking every meal in lard, but when you’re making that Sunday supper of Fried Chicken…nothing is going to make that crust crispier or more flavorful than lard (unless maybe you add some bacon fat as well.) If you only make Pies once or twice a year and you KNOW that Leaf lard makes THE BEST pie crust, why not use it? How much is each guest going to have? One Piece? Two? If this were a pie eating contest you should be concerned. It’s not. Use what yields the best results. When talking about lard, I’m talking about homemade rendered lard. I don’t like the stuff they sell in the grocery store, which is a mixture of lard and hydrogenated lard. It tastes funny in my humble opinion, it has a chemical like aftertaste. I’m not a chemist or a scientist, I don’t know what the hell they do to hydrogenate fats or oils (by the way I don’t want to know, for the comments section…kinda kidding). I do believe however that the processed foods are the foods that are killing us, or better said that we’re killing ourselves with. I’m not a crazy organic guy, but lets be honest, we’re killing ourselves with all of this mass produced crap. We really are, I’m no exception. Make your own lard. Use it for special occasions, or for your favorite dishes where it applies. Use it in moderation and ENJOY it! Don’t stress about it! Enjoy life! Our culture has us stressed about everything under the sun, we’re afraid of our own shadows for God’s sake…it’s ridiculous. The dinner table is really our only place to relax (when we can even make it there), so when you sit down at the dinner table, relax! Free your mind and indulge in GOOD cooking and good company! 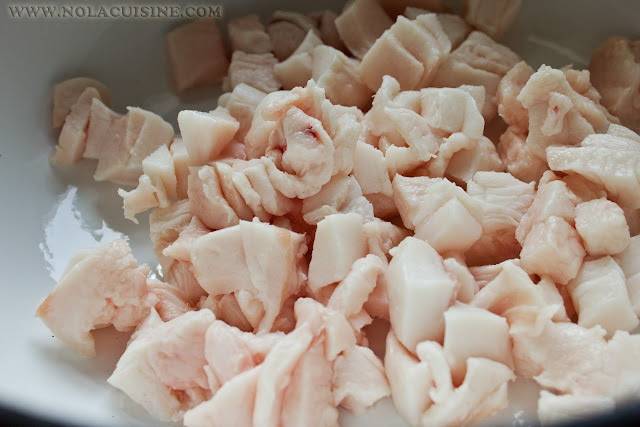 *Cut the fat into equal sized pieces, this helps to prevent some pieces from geting too brown before others, which will give the lard an off flavor. *Remove all lean meat from the fat before rendering. 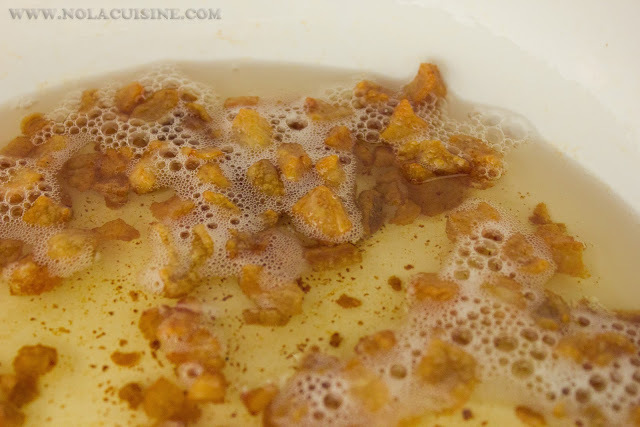 *1/4 cup of water is added to the pot for each pound of pork fat. This keeps the fat from burning or browning in the pot, before the fat starts rendering. The water will evaporate away. Cook the fat and water at medium-high heat until you start to see the fat really start to liquify in the pot, turn the heat to low. Cook slowly for 1-1/2 to 2 hours. 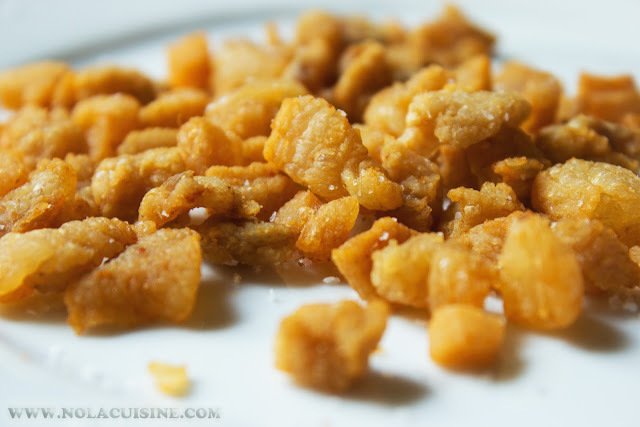 Your lard is ready when the remnants in the pot, now called cracklings are golden brown. Strain the cracklings in a fine mesh strainer, obviously reserving your beautiful golden homemade lard. Drain the cracklings on paper towels season them with salt and snack on them, or use them to make Crackling Corn Bread! Place into a clean, dry container, I use a French Market Coffee can, and store in the refrigerator for at least six months. 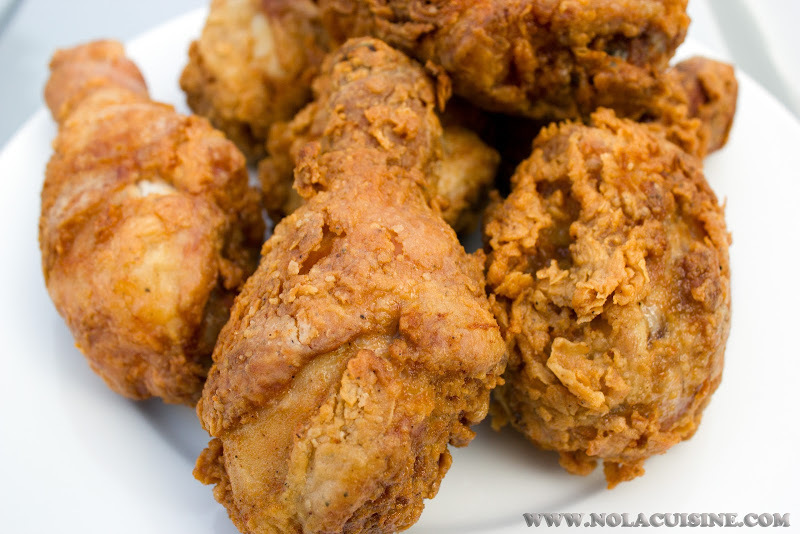 Use to make Fried Chicken that looks like this and tastes even better! I’ve been following the Donald Link’s (Chef and author of Real Cajun ) video series called Taste of Place on his website, if you haven’t checked it out, I highly recommend it. He tours farms, goes out with fisherman, and visits with purveyors of superior products, not just in Louisiana, but primarily in the south. He then usually does a cooking video with whatever product was featured. Long story short, I recently caught the episode where Link visits the farm of Kurt & Karen Unkel who own and operate a rice farm in Kinder, Louisiana (the video is embedded below.) Kurt’s words and philosophies really make sense to me. He’s organic, not because it’s trendy, but because it makes the most sense, for nutrition, flavor, and I’m sure profitability. The rice goes into a slow feed and a husker and into the bag that it’s shipped in. 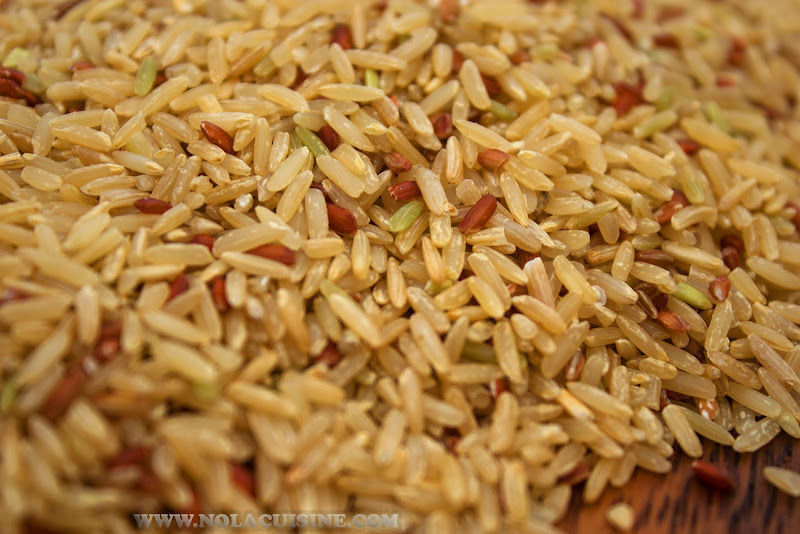 It still contains the germ and all of the other elements that a nutritious rice should. I visited the Cajun Grain website after viewing this video and was elated to see that they sell their Cajun Grain Brown Jasmine Rice on Amazon! I immediately ordered two 4 lb bags which arrived a few days ago. Kurt has also been featured in the documentary film Harmony, which is narrated by Prince Charles, as well as the New York Times article, Rice Dreams in Louisiana. 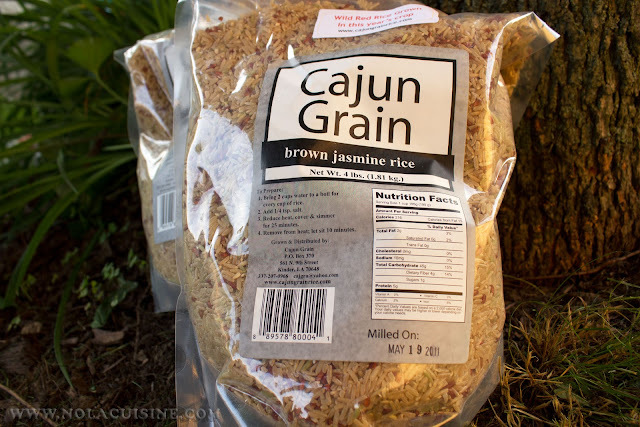 Cajun Grain Brown Jasmine Rice, Two 4lb. bags . Stay tuned as I can’t wait to share some recipes using this wonderful Louisiana product! 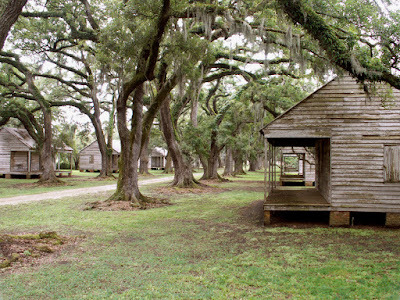 I am also in full swing in sharing all of the details of my most recent trip to Louisiana! 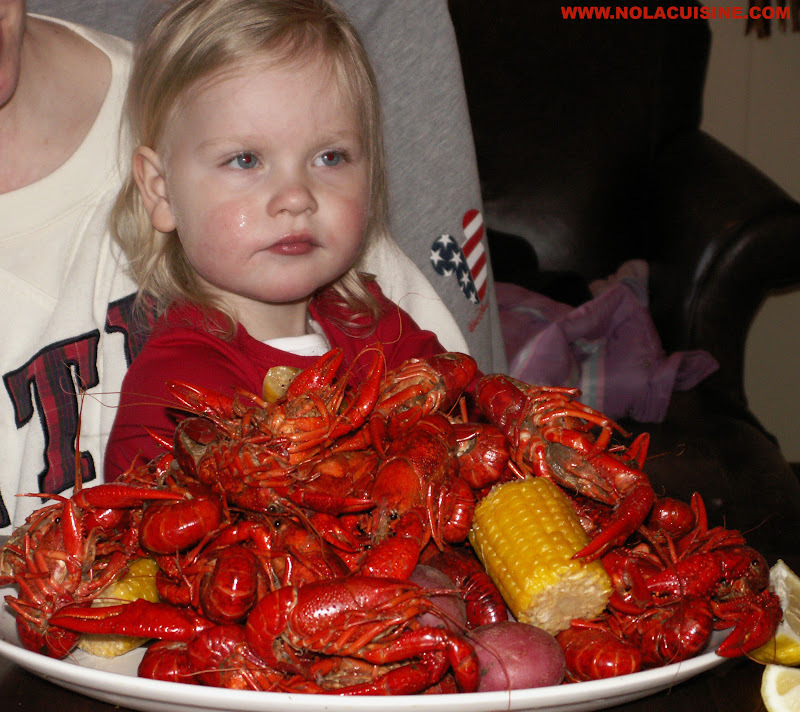 Most recently, my visits to Middendorf’s Seafood Restaurant and the Abita Brewery. It feels good to be back!! As much as I love the spring Crawfish Boil, I always look forward to having some leftover Crawfish tail meat to play with for later use. 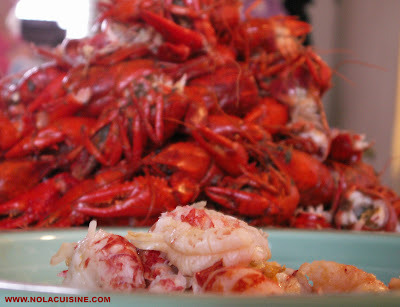 After my spring boil I had a fair amount of Crawfish leftover so I sat down with a cold beer after our guests had left, relaxed and picked all of the tail meat as well as the fat from the heads. This is one of those tasks that is actually a very therapeutic process for me, like peeling shrimp, or making roux, where you can just sit or stand there and enjoy the silence and repetition of the task at hand, let your brain go and think about whatever; kind of like sleep without the bad dreams. I ended up with about 2 pounds of tail meat, the perfect amount for a nice batch of Crawfish Etouffee. 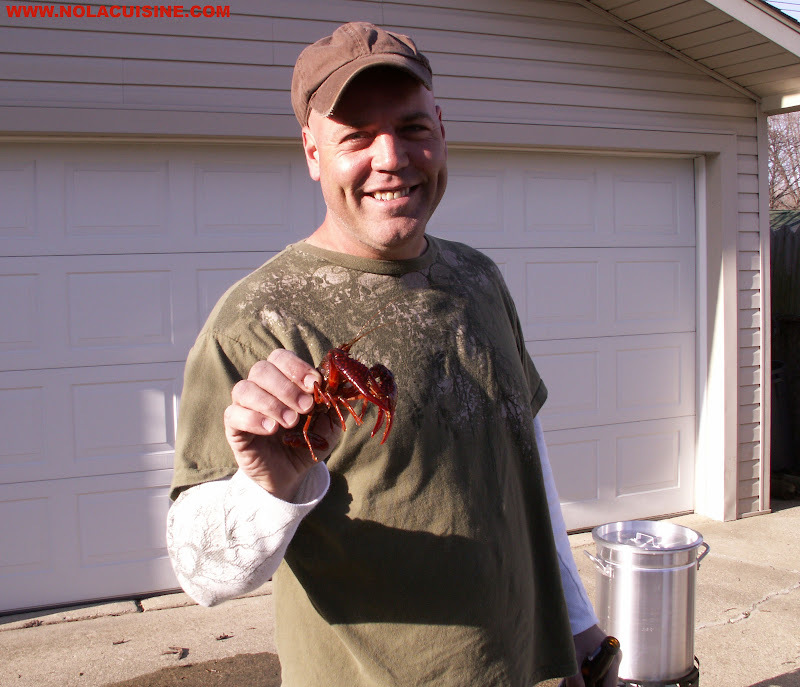 I made a batch of Crawfish Stock from the shells and vacuum sealed the tails and fat for later use. Which brings me to lunch today. 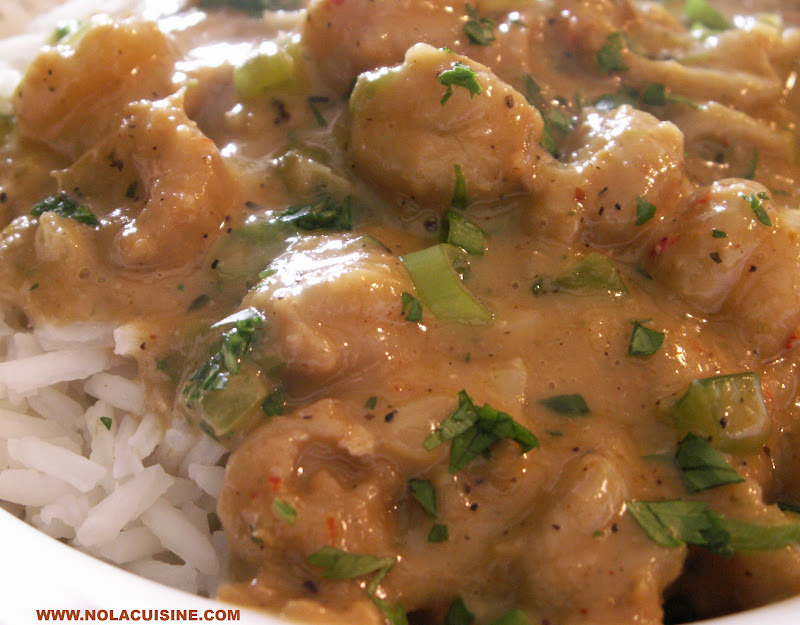 The smell of Crawfish Etouffee or Shrimp Etouffee (my recipe), makes me more nostalgic for Louisiana than any other dish I can think of, even above Gumbo and Red Beans. I arrived home from work tonight to sit down and write this post and was met with the aroma of Etouffee still hanging out in the house, heavenly. The real key to this recipe as with my Shrimp Etouffee, is the stock. 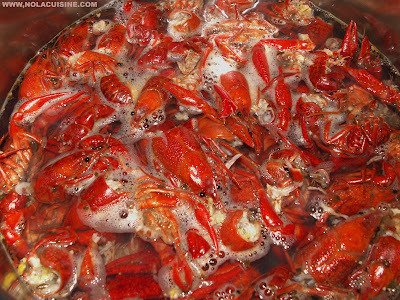 Seafood stocks are simple and require a very short cooking time yielding great results. This recipe leans a little more to the country than my Shrimp Etouffee Recipe, although they are similar, neither shy with the butter, but this one doesn’t use tomatoes. I hope you enjoy it! Melt the butter in a large cast iron skillet, add the onions, bell pepper, celery, and 1 Tablespoon of the Creole seasoning, saute until translucent. 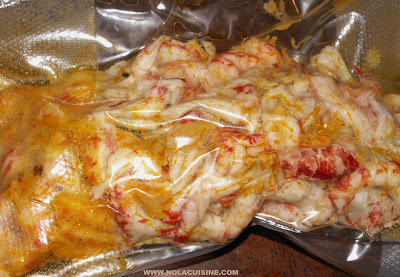 Add the Crawfish tail meat, the remaining Creole seasoning and saute until the tails let off some of their liquid, cook for 3-5 minutes more. Add the flour, stirring constantly for about 3-5 minutes. 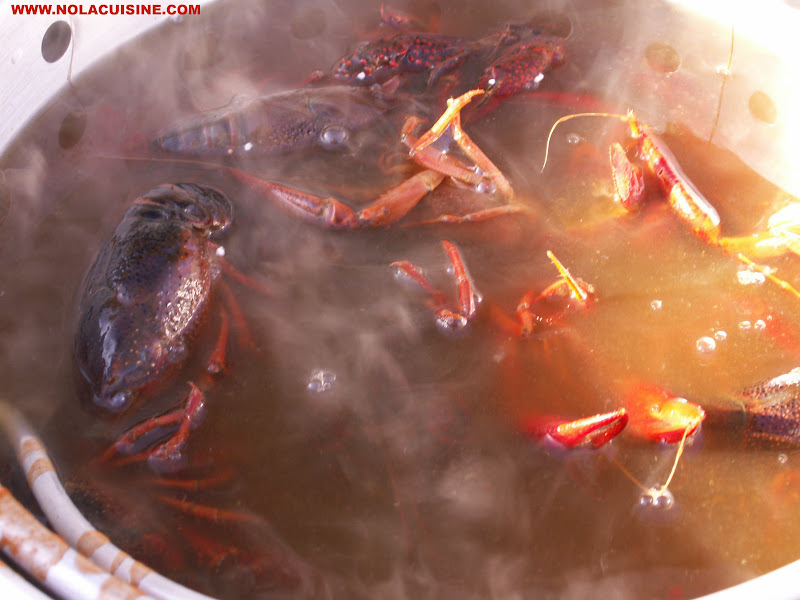 Add a small amount of the crawfish stock, stir well to form a paste, add the remaining stock gradually, whisking constantly. Bring to a boil, then reduce to a simmer. You may need a little more stock, but the end result should be the consistency of a gravy, not too thick, not too thin. Add the garlic, Thyme, Worcestershire, and hot sauce, a little salt, black pepper. Simmer for 20-30 minutes. Add the green onions and parsley, simmer for 5-10 minutes more. Stir in the 3 Tbsp butter, lemon juice, and adjust the seasonings to taste. Serve over Creole Boiled Rice. Serves 4 as an Appetizer or 2 as a large entree. 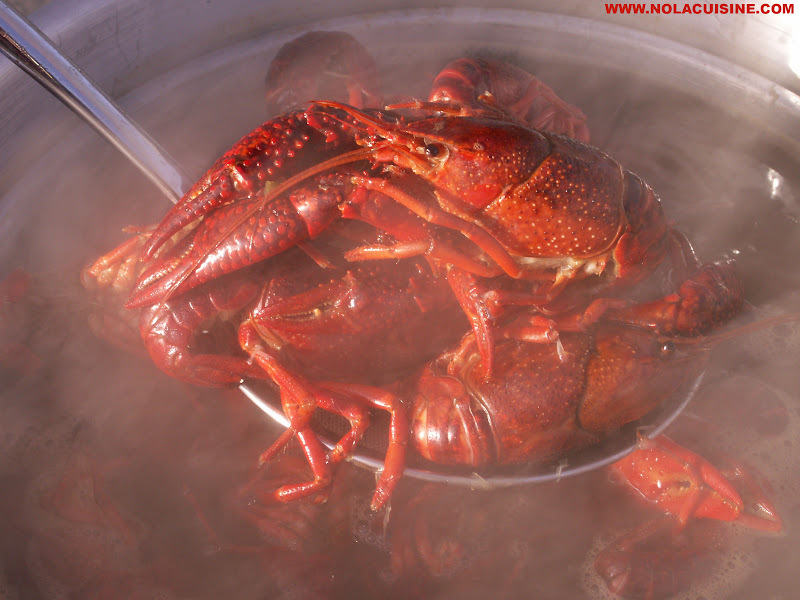 Be sure and check out my ever growing Index of Creole & Cajun Recipes which provides links to all of the recipes featured on this site! 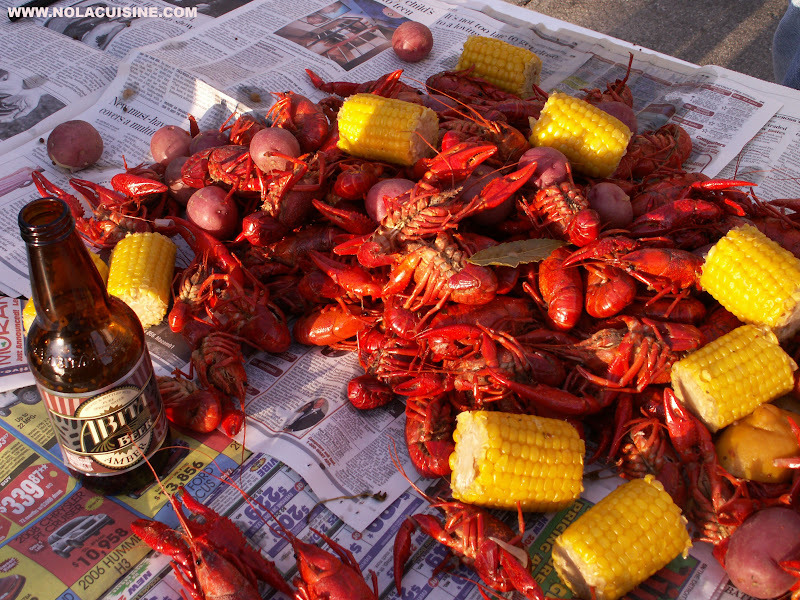 Any spring social event in Louisiana is most definitely going to be centered around a Crawfish Boil. 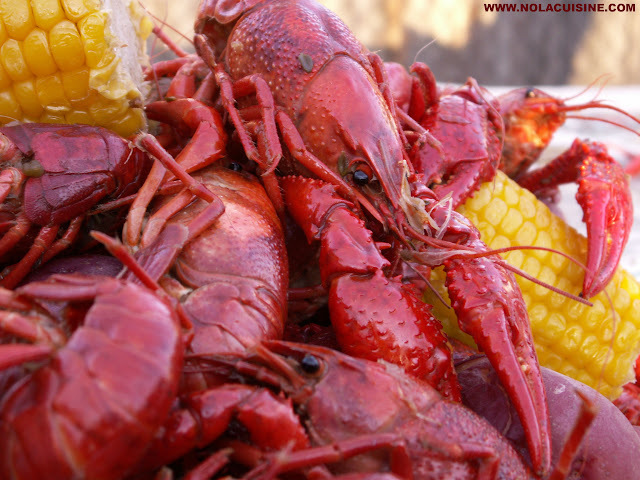 This is a time to relax with family and friends, enjoy the outdoors, and enjoy the bounty of the season, live Louisiana Crawfish. The magic behind your boil, in my humble opinion, remains in the hands of two details. 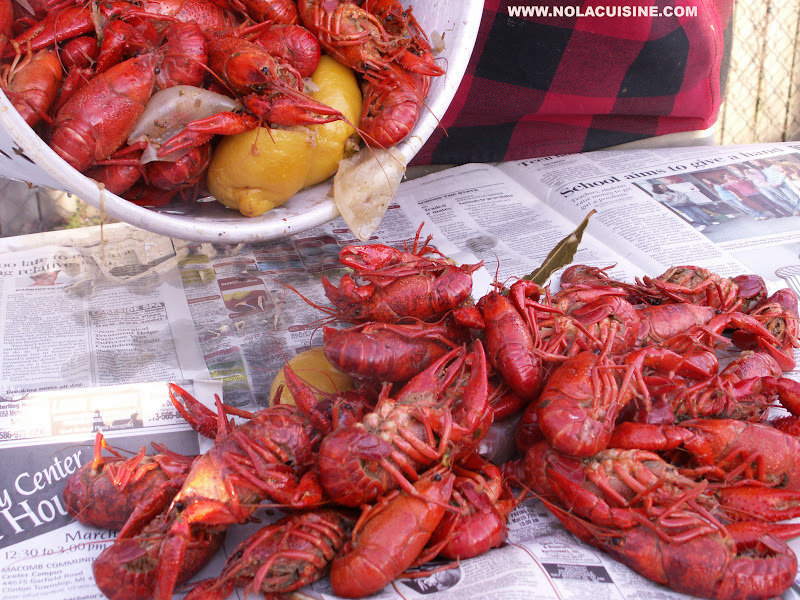 Fresh, Lively Crawfish, and your cooking liquid. 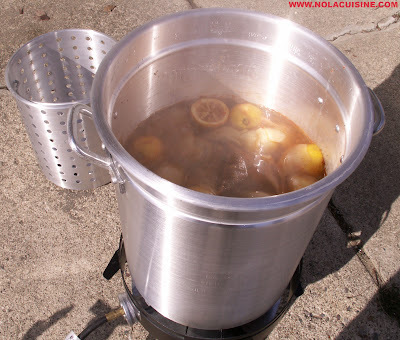 Bring the water to a boil in a 30 quart Turkey fryer pot with the onions, lemons, garlic, bay leaves, crab boil, cayenne and salt. 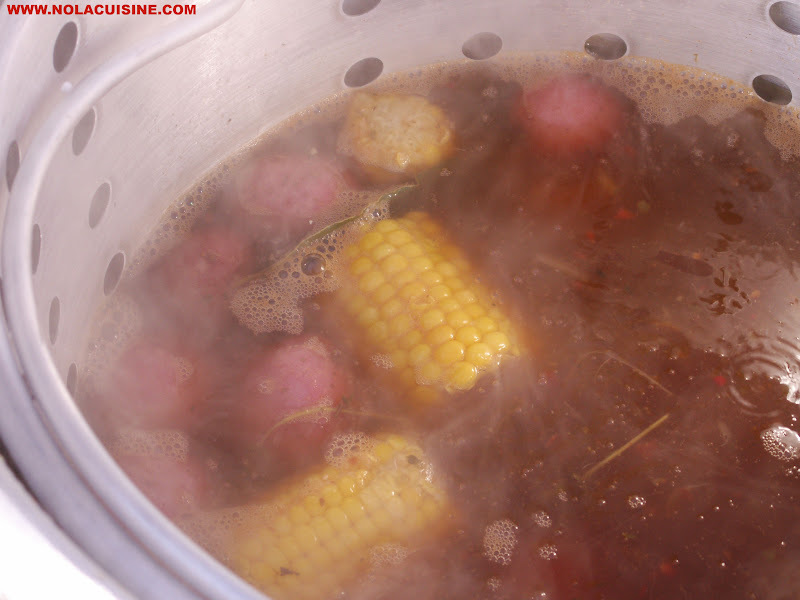 When the mixture reaches a boil, reduce to a simmer, partially cover and cook for 45 minutes to 1 hour. 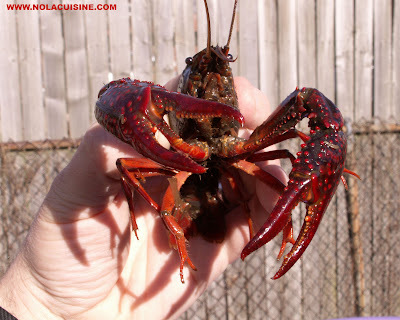 Your crawfish should be picked through for dead ones and placed and washed by first hosing them down, then leaving them in the basket and placing it into a large pot, filling it with water, draining, filling with water, draining, until the remaining water is eventually clean, about 3-4 times. I’m not in the purging with salt camp, I don’t think it does anything more than what I described above. While you’re waiting, and this is a very important part of this recipe, drink a few of your favorite ice cold beers and go visit with your company, this is a social event, relax enjoy! Have the washed Redskins waiting in the basket insert nearby and visit. Take advantage of the downtime! Before adding anything to the pot, taste your cooking liquid! It should taste overly salty and overly spicy. Drink more cold beer, then add your basket insert to the pot with the potatoes. Let cook for 15-20 minutes. After said time has passed add the corn, and cook for about 10 minutes. 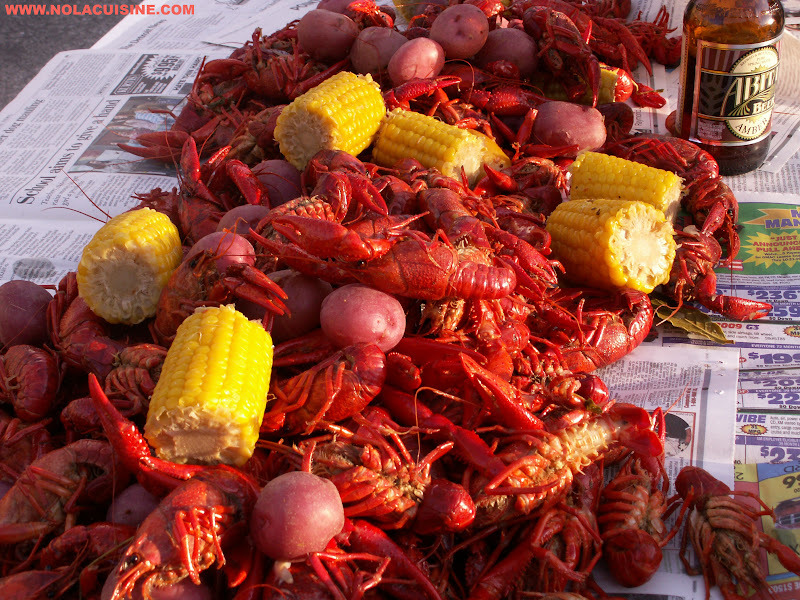 Bring the liquid to a boil and add the live Crawfish. Bring the pot back to a boil as quickly as possible, give a good healthy stir and boil for about 5-10 minutes depending on their size. 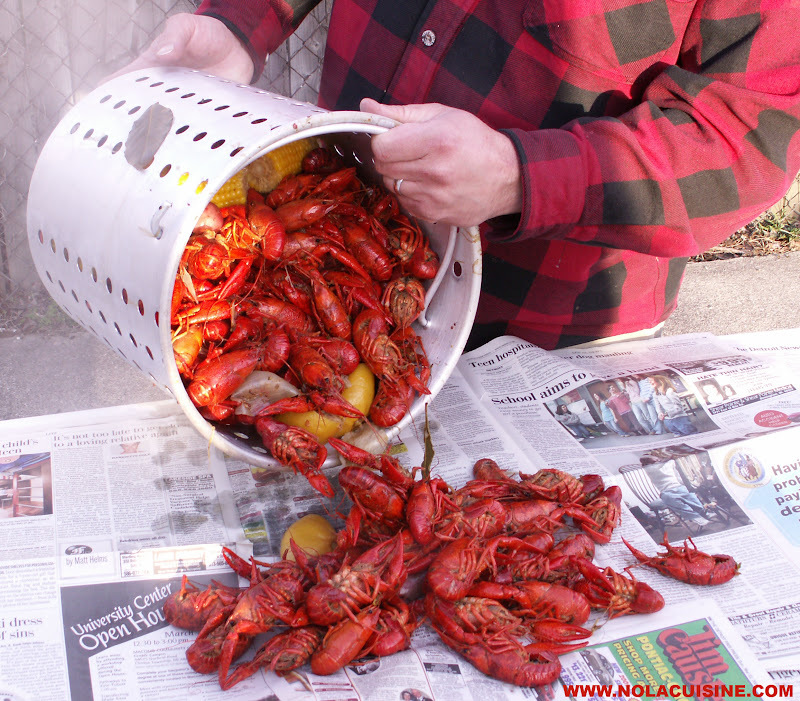 Turn off the heat, put a lid on the pot and allow the crawfish to steep in the liquid for 20-30 minutes. The longer they steep, the spicier and more flavorful they will become. When in doubt as to how long to let them steep, pull one out and have a taste! When you’re sure that they are ready, lift the basket and let them drain. When they are well drained dump the contents of the basket onto a picnic table or any outdoor table heavily lined with newspaper. Everyone please note, I don’t have any feeling left in my hands from working in the kitchens all these years. The girls were laughing as I was holding the basket with steam blowing off of it, this isn’t a dummy shot, just a big dummy holding a hot pot with bare hands. Let your guests belly up to the table and eat until their hearts are content! Here are some pics from our small but wonderful boil! The full spread, the potatoes and corn take on all of those wonderful flavors. The potatoes especially, the skins dry out and develop that salt crust and the insides take on the spice. Here is my baby girl Anna with her portion. Yeah, that was a gag shot, we can’t even get this little one to eat chicken fingers, don’t worry though, I will keep cracking away on her culinary darings. Thanks again to Charlie and the fine folks from Cajun Grocer for the generous portion of their premium Live Louisiana Crawfish! This is my brother Brad. We don’t get together as often as we should these days but this boil was the perfect opportunity to do so and we had a wonderful time. Brad actually helps me with all of the technical details on this site and even hosts it for me on his server! He is also responsible for the new layout, which I absolutely love and has inspired me to start posting more often. Thanks for everything Brad! 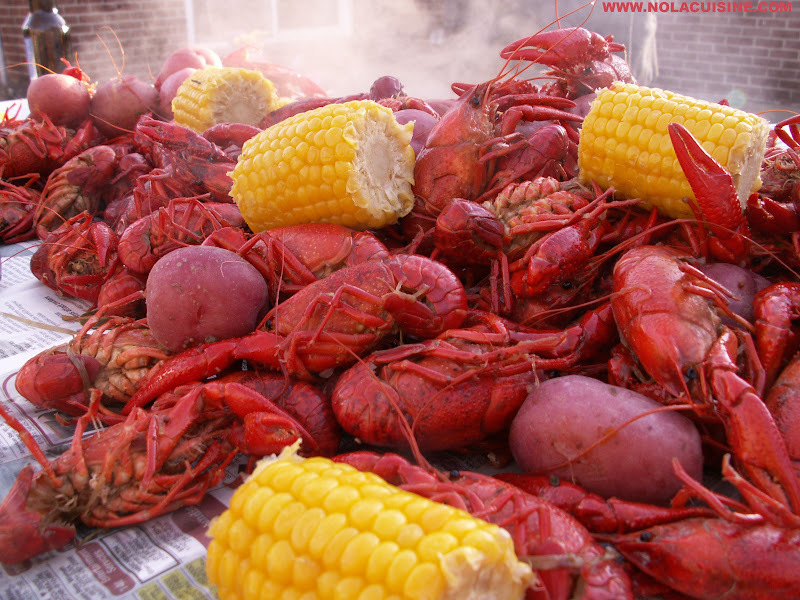 Be sure to check out my ever growing Index of Creole & Cajun Recipes which provides links to all of the recipes featured on this site! andouilleboiled crawfishboiled crawfish recipebouidinbreux bridgecajun grocercajun recipescochoncommander's palacecooking up a stormcooyon's crawfish boilcorncrawfish boilcrawfish boil recipecrawfish etouffee recipecrawfish piccreole recipesdonald linkemeril lagasseencyclopedia of creole and cajun cuisineetoufeetouffeefood networkhow to boil crawfishjamie shannonjohn folselouisianalouisiana crawfish boillouisiana crawfish boil recipemarcelle bienvenu crawfish boilnew orleansnola.compaul prudhomme crawfish boilpotatoespurge crawfishtalk about goodtassotimes picayunetom fitzmorristory mcphailwho's your mama are you catholic and can you make a roux? I am on the road back to New Orleans for a very brief stay with an obscenely aggressive dining schedule! I am absolutely fired up!! First on my list is Cochon Butcher, then Mandina’s, Parasol’s, Cassamento’s (my third attempt, always closed for one reason or another when I get there), and even if I have to use the Vomatorium, I will make sure that I get an order of Drago’s Charbroiled Oysters before I go. 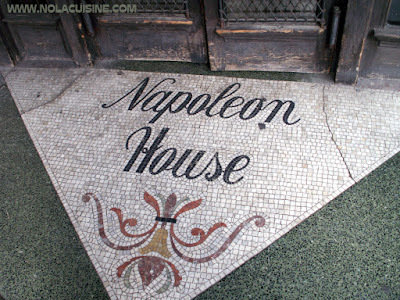 I also have a few other culinary attractions that I aim to make it to on my short trip, more to come. I’m arriving on March 08, with an empty stomach as well as an emtpy digital camera card, and I’m leaving March 10 in the evening with both full to the gills. I really can’t wait. 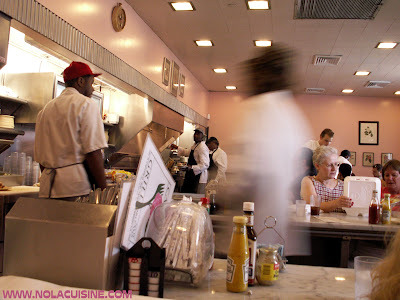 Here are some of my favorite pics from my last two trips, culinary and non. 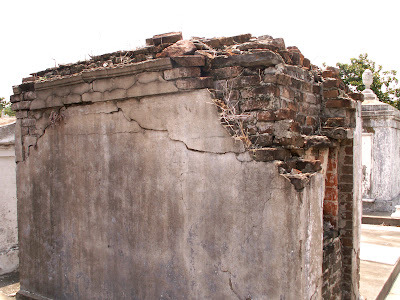 Lafayette Cemetery, across the wall from Commander’s Palace. 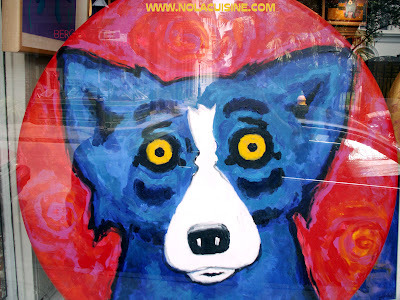 Blue Dog window shopping with reflection of Royal Street and St. Ann. 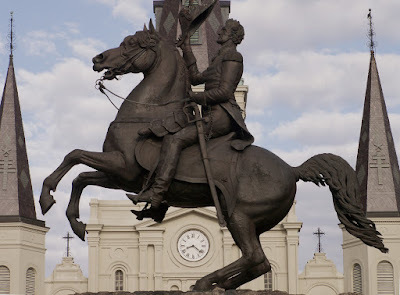 Statue of Andrew Jackson with St. Louis Cathedral in the background. 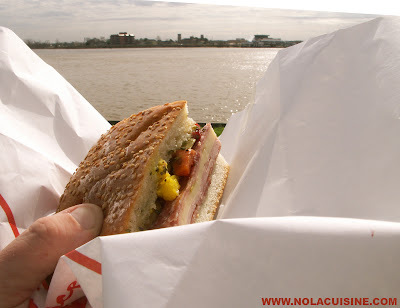 Central Grocery Muffuletta on the banks of the Mississippi. 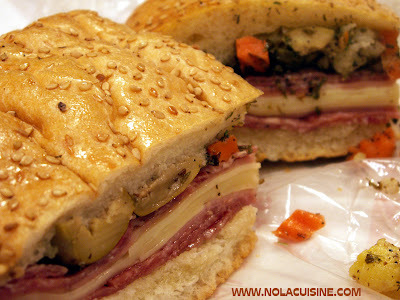 The Central Grocery Muffuletta after a bit of air travel. I felt the same way, a little battered, but still good to go. 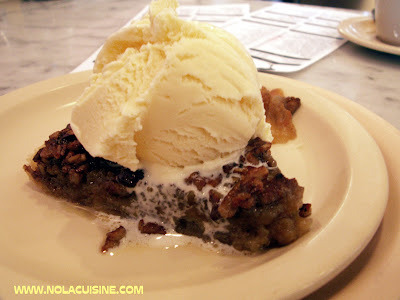 …and the best damned Pecan Pie! 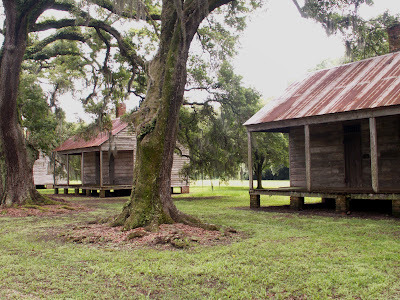 Slave Quarters Evergreen Plantation. 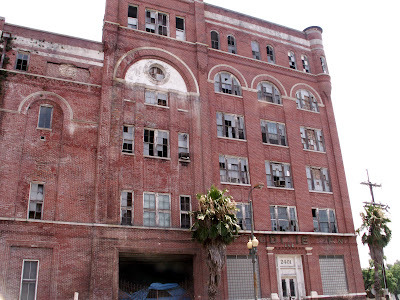 An eye opening and haunting experience, not in the “this place is haunted” sense, but the “this is how our country was built, and it should be haunted” sense. Pictures do not do this place justice. 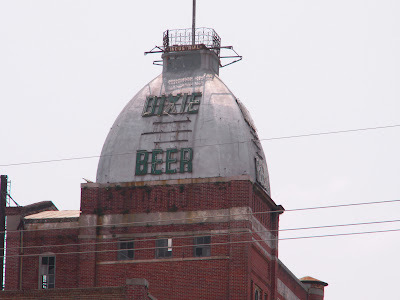 The battered Dixie Brewery. I never posted on this, it was too damned depressing. I will post a few now. Who was the biggest Vandal? Katrina or THE vandals? 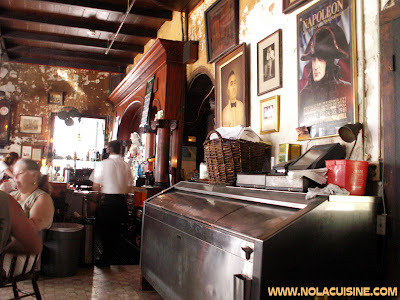 Napoleon House, love this place. I imagine I would disappoint just a few if I didn’t mention these! Much more to come!!! See you soon New Orleans! 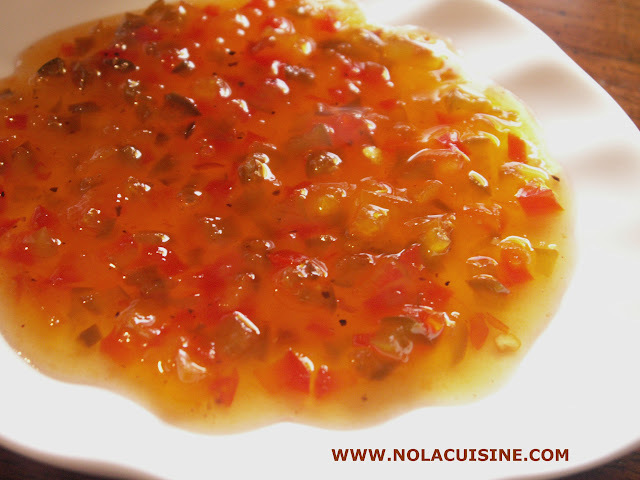 Pepper Jelly, while not an ingredient specific to New Orleans is a staple of the South, including Louisiana. You can probably find a jar of Hot Pepper Jelly in your local grocery store, probably a green or red Jalapeno version, made with food coloring. 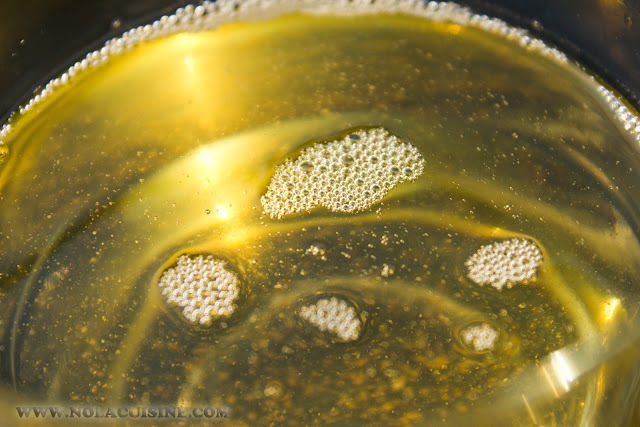 The most interesting Pepper Jellies to me are the fancier versions that have been created by some Chefs and home cooks in New Orleans and across the South that have been woven in with other wonderful local flavors to create some fabulous new dishes. The crown jewel of these dishes, in my humble opinion, is Shrimp and Tasso Henican created by the late Chef Jamie Shannon of Commander’s Palace. 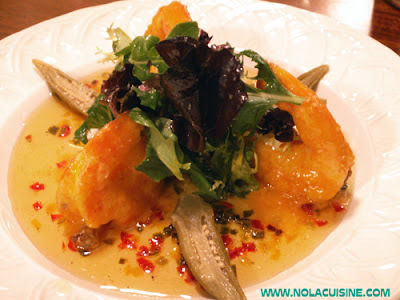 Louisiana Shrimp larded with Tasso, sauteed and coated with Crystal Hot Sauce Beurre Blanc served on his 5 Pepper Jelly with pickled Okra. Seriously folks, this is one of the greatest dishes I have ever had the pleasure of eating. Here is the Commander’s Palace Recipe, and a pic of my recreation of the dish at home. A few other dishes in New Orleans restaurants that include Pepper Jelly are Cochon‘s Fried Chicken Livers on Pepper Jelly Toast (read my Cochon Post), and Bayona‘s Smoked Duck “PB&J” with Cashew Butter, Pepper Jelly, and Apple Celery Salad. I love making a batch of Pepper Jelly to keep around the house because it is such a diverse ingredient. Recently I served it to some guests at a dinner party as a dipping sauce with Spring Rolls. To Brunoise (very fine dice) the peppers, trim the ends of the peppers and cut the peppers so that you have a relatively flat piece. Lay the pepper flat on the cutting board, press the knife horizontally on the pepper and cut away the ribs and whiter parts of the pepper, pressing down the pepper to the board as you cut, until you have a brightly colored piece of pepper about 1/8″ thick. Now cut into brunoise. Save all of the trim from the red and yellow peppers, discard the green trim. Sterilized glass Jelly Jars with lids. Cut all of the fresh peppers into brunoise and combine. Combine the trim from the red and yellow peppers with the vinegars in a small saucepan, bring to almost a boil and turn of the heat. Let the pepper trim steep in the vinegar for 30 minutes. Puree the peppers and vinegar mixture in a blender or with an immersion blender. Strain through a fine mesh strainer. Add the strained vinegar back to the saucepan with the sugar, Bring to a boil then turn down the heat to a simmer. Add the black pepper, crushed red pepper, crab boil, and the bay leaf. Simmer until reduced by about 1/3. In the meantime, in a stainless steal saute pan over medium heat, sweat the peppers until very dry, stirring constantly, do not allow to brown. Set aside. When the sugar and vinegar mixture is reduced remove from the heat. Remove the bay leaf and add the brunoise peppers and the liquid Pectin to the mixture. stir well. Place in the sterilized jars, leaving a 1/2 inch of room and put the lids on snugly. Process in a hot water bath with enough water to cover the jars for 10-12 minutes. Remove and let cool to room temperature. When cool, check to make sure that the jars created a seal, and tighten the screw lids. Store in a cool dark place for up to 12 months. Refrigerate after opening. Be sure and check out my ever growing Index of Creole & Cajun Recipes, which has links to all of the recipes featured on this site! Shrimp and Eggplant are a perfect flavor match in this traditional Creole Italian dish, neither trying to overpower the other, just existing in perfect harmony, kind of like Oysters and artichokes, and Okra and Tomatoes. 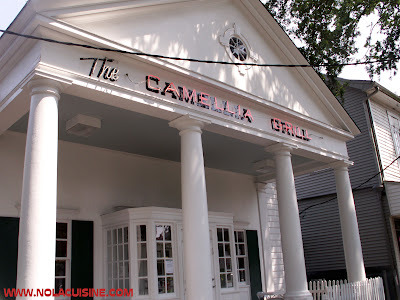 Besides the Muffuletta, you don’t hear as much about the Italian and Sicilian immigrant contribution to Creole Cuisine as you do the French influence, this is just one. 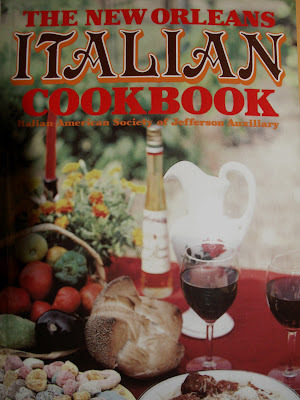 By the way, there is a great little book from Pelican Publishing in Gretna called The New Orleans Italian Cookbook , a compilation of recipes from the Italian American Society of Jefferson Auxillary. It was first published in 1979, it features recipes from a lot of different people, from Chefs to homecooks, a great little book. Back to the dish, it’s important to use small eggplant, because they have very few seeds, it’s just less headache. Also, you could alternately boil the eggplants whole, scoop out the pulp and save the shells to bake your dressing in, if you’re into that sort of thing. As far as the shrimp, I only use wild caught American shrimp these days, if I can’t get American, I don’t eat Shrimp. True, they are more expensive than the flavorless Southeast Asian farm raised stuff out there, and harder to find for that matter, but they taste a whole lot better; and more importantly, purchasing them supports our own Shrimp fisherman who are absolutely suffering these days. I served this as a side to a big plate of Fried Chicken, Green Onion mashed Potatoes, and Cornbread. Bring the water to boil in a Dutch Oven. Add the Bay Leaf, bundled Thyme, reserved Shrimp shells, crab boil, any trim from the diced onion, and a handful of Kosher salt. Boil for about 15-20 minutes, skim off the scum from the shrimp shells. Add the Eggplant and reduce to a simmer. Cook until tender about 20 minutes. In the meantime, melt the 3 Tbsp butter in a saute pan. Add the onion, bell pepper, garlic, and a pinch of salt, saute until the onions are translucent, add the chopped Thyme and the chopped shrimp, cook until the shrimp are just cooked through; set aside to cool. When the eggplant is very tender remove with tongs to a colainder to cool. When cool, squeeze some of the liquid from it and chop. In a large bowl combine the eggplant, onion & pepper mixture, egg, fresh basil, and parsley, mix ingredients together well. Add the bread crumbs a little at a time until the right consistency is achieved; it should be not too wet, not too dry. Check the seasoning; season to taste with Kosher salt, Cayenne, and black pepper. Add the mixture to a buttered gratin or baking dish. Mix together the topping ingredients, top the shrimp and eggplant dressing with it. Bake in the preheated oven until bubbly and the topping is a nice golden brown. Makes enough for a side dish for 4. Be sure and check out my ever growing Index of Creole & Cajun Recipes which links to all of the recipes featured on this site! **UPDATE** My latest Boudin Recipe complete with PHOTOS! 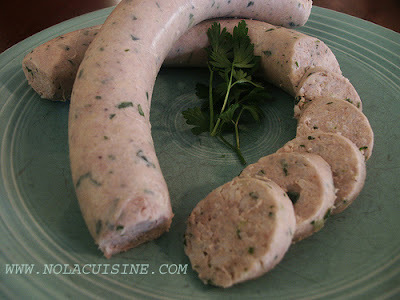 The commonly known Louisiana Boudin (BOO-dahn) is Acadian through and through, traditionally made as a way to stretch the meat after a Boucherie, to feed more mouths. There are two varities, Boudin Blanc, commonly just refered to as “Boudin”, and Boudin Rouge, which is becoming very difficult to find. It is made in a similar fashion but with fresh pig’s blood. Believe me, if I ever get my hands on some fresh pig’s blood, you will definately see a Boudin Rouge recipe on this site. In Cajun country there are as many Boudin recipes as there are cooks, most using basically the same ingredients, in different proportions. 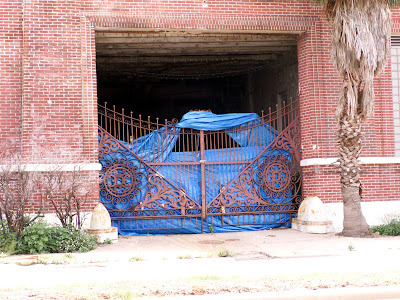 You can find Boudin sold just about anyplace along the road that has a roof (probably some without.) 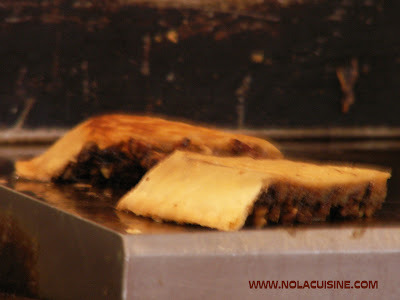 Gas stations, shops, you name it, they will most likely have a sign that says “Hot Boudin”. The old Creole versions were more along the lines of the traditional French, made with meats and fowl and a panada (bread and cream) as a binder (To see a more traditional French version of Boudin Blanc, see my friend Carolyn’s recipe at 18thC French Cuisine). The Acadians use(d) rice, something that was/is plentiful in South Louisiana. Cut the pork steak and liver into 2 inch pieces and place in a large saucepan, along with the onion, garlic, thyme, and bay leaves. Cover with cold water by 1 1/2 inches. Season well with salt and black pepper. Bring to a boil then lower the heat to a simmer, skim off any scum that rises to the surface. Simmer for about 1 hour or until the meat is very tender. Remove the bay leaves, and thyme, then strain the solids from the broth, reserve the broth. Grind the meats and cooked onion and garlic while they’re still hot, you could also chop this by hand. In a saucepan with a lid, combine the rice with 3 Cups of the reserved broth. Taste the broth for seasoning, if necessary season with salt and black pepper. Bring to a boil, then down to very low heat and cover. Cook until the rice is tender and the liquid is absorbed, about 20 minutes. When the rice is cooked, combine it with the ground meat mixture, green onions, and parsley. Mix thoroughly and season to taste with Kosher salt, black pepper, and Cayenne. Stuff into prepared hog casings (instructions on how to link homemade sausage), or form into patties or balls for pan frying. This also makes a great stuffing. To heat the stuffed Boudin sausages, either poach them in water between 165-185 degrees F, or brush the casings with a little oil and bake in a 400 degree oven until heated through and the skins are crispy. When I poach them, I take the Boudin out of the casings to eat it because they become rubbery. 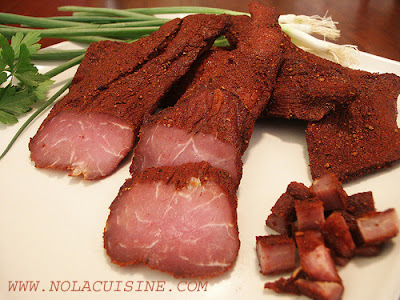 Tasso (TAH-so) is a smoked seasoning meat used to flavor dishes like Gumbo, Jambalaya, and Red Beans & Rice. Tasso used to be made from the trim after an Acadian Hog Boucherie, thin strips, heavily seasoned, dried, then smoked for hours. These days however, most of the Tasso that is available is a little more fancy, more of a ham than the style of the old days, mine is somewhere in between. I always find it amazing how ingredients and recipes, that basically came from scrap and the poorest times evolve into Gourmet, I love it. Tasso will keep in the freezer and is pretty easy to make, but you have to do a little planning. After seasoning it, I recommend keeping it in the fridge, at least 3 days to let it cure, look at how nice and pink the center is. Take it easy on the Cayenne when making your seasoning blend, start off with a small amount, then add to your taste, the amount here is moderate. It should have some heat, but I don’t like losing control of the heat in a dish I’m cooking because my Tasso was too hot, so I cut it back a little, for the same reason that you don’t salt stocks. Mix the seasoning together well. Rub the seasoning into the meat, you want a lot on there, call it 1/8 inch, use it all. Place on a plate or tray, cover and refrigerate 3 days. Before smoking put the Tasso on an elevated rack so that air can circulate around it, then put a fan on it for about 2 hours to dry it out. I also don’t use a water pan when smoking Tasso, this is something that I actually want to dry out during the smoking process. I hot smoked this batch in an inexpensive upright barrel smoker using charcoal as the heat source (heated with a chimney starter, no lighter fluid or matchlight coals please.) I used Pecan chips that were soaked in water for 1 hour for the smoke. I smoked this a total of about 4 hours, the first 2 hours at about 150-160 degrees F. The second two hours at 180-190 degrees F.
The object is to get as much smoke into the meat, before cooking it all the way through. I brought the internal temperature of the meat to 150 degrees F in the last 2 hours of smoking. When finished I again put the Tasso in front of a fan for about 1 hour. Refrigerate. When completely cold portion and store the Tasso in vacuum sealed packages. Freeze. 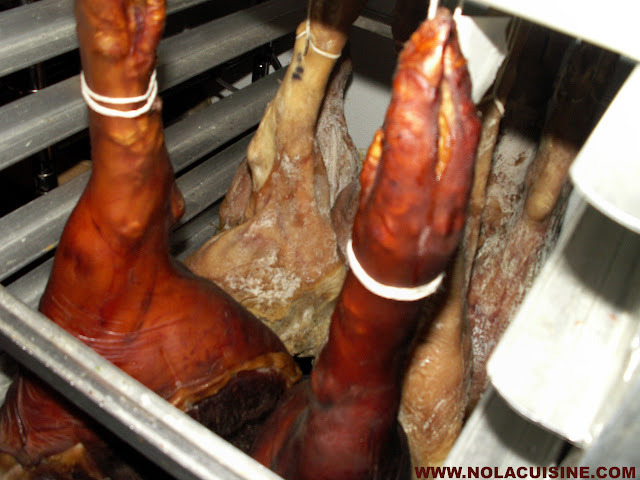 Check out these Pics at Egullet of Wayne Jacob’s beautiful Tasso and Andouille, made the old way in LaPlace, Louisiana.